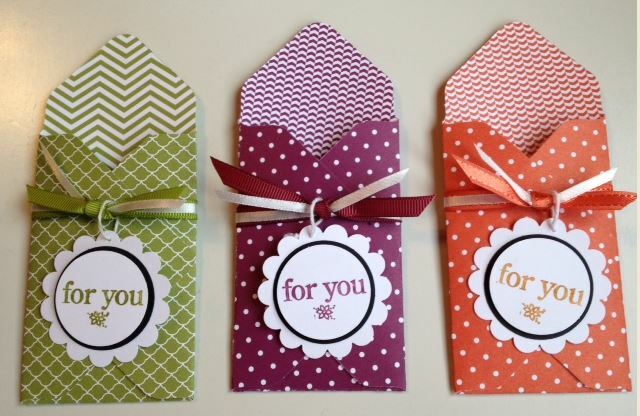 These little treat pockets are sooooooooooooooo easy to make using Stampin’ Up!s Envelope Punch Board. They can be used for any occasion – Birthday, Halloween, Christmas, Valentine’s Day etc. You can fill them with a small treat of some sort (my suggestion is chocolate – I LOVE chocolate – lol). A gift card will fit perfectly as well. Add some ribbon and a tag and you are good to go. I CASE’d this from Angie Juda. Check out her Chick-n-Scratch site to watch a video re how to make this. Start with a piece of paper 5″ x 5″. Tip: When you are making envelopes using patterned paper that has a linear pattern like dots or flowers in rows- cut your paper on the diagonal. If you do not cut the paper on the diagonal the finished product will look a little wonky. Using the envelope punch board punch and score the first corner at 2″, the next corner at 3″, then the next corner at 2″ and the last corner at 3″. Round all corners. Fold 3 corners leaving the top not folded down. Decorate using the 1⅜” and 1¼” circle punches and the 1¾” Scallop Punch. This entry was posted in Gift Ideas, Party Favours and tagged Envelope Punch Board. Bookmark the permalink.